Dorrie Barnes had no idea an overdue library book would change her life. When Dorrie and her brother Marcus chase her pet mongoose into the janitor's closet of their local library, they accidentally fall through a passage into Petrarch's Library -the headquarters of a secret society of ninja librarians who have an important mission: protect those whose words have gotten them into trouble. Anywhere in the world and at any time in history. Dorrie would love nothing more than to join the society. But when a traitor surfaces, she and her friends are the prime suspects. Can they clear their names before the only passage back to the twenty-first century closes forever? 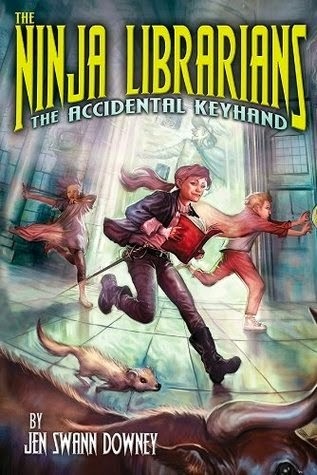 FORMAT: The Accidental Keyhand is the first book in the Ninja Librarian series. It is a children's fantasy novel that combines time traveling, adventure, sword fighting, magic, and mystery. It stands at 384 pages and was published April 15, 2014 by Sourcebooks Jabberwocky. ANALYSIS: When I first saw Ninja Librarians in the library, I was a bit unsure how this book would be received. It seemed to take a whole bunch of random stuff and pack it into one book. It claimed to have adventure, mystery, time-traveling, ninjas/fighting, libraries, and lots and lots of books. There was a lot that could go wrong with this book, so I approached it cautiously. After reading it, all I can say is – I was wrong. Ninja Librarians is a fun, adventurous children's novel that is unique, fast-paced and designed for readers of all ages. At just under 400 pages, this novel creates a truly unique world, takes readers on an adventure, and leaves the door open for more adventure and fun! The basics of the plot for this first book of the series is that two youngsters – Dorrie and Marcus – fall through a portal of sorts. The portal, which is located in the closest of their local library, takes them to a mysterious labyrinth that is made up of dozens of different libraries. Only these libraries are connected to different parts of the word and different times. The labyrinth, which is known as Petrarch's Library, is actually a secret headquarters of sorts for librarians who are fighting to protect the rights of others who have gotten in trouble for what they wrote/penned. Librarians aren't the people that you see behind the desk. These librarians are trained fighters who are quick on their feet and ready to fight. The Accidental Keyhand follows Dorrie and Marcus as they learn more about Petrarch's Library and fight to earn a place in the highly secretive society. Unfortunately, there is an evil counter organization out there that would like nothing more than to see Petrarch's Library and all those associated with it taken down. Dorrie and Marcus must work to clear their name and prove they are not a part of this society before it is too late. There is so much to like about The Accidental Keyhand - the strong, fast-paced nature of the writing, the unique world that is created, and the likeable characters. It is almost impossible to know where to start. Jen Swann Downey does an amazing job of crafting a story that moves at an extremely fast-pace, but that doesn't seem to brush over tiny details. While reading, I was able to acquaint myself with the world, learn about the characters, and get a whole backstory to the main story, without feeling like I was being bogged down with endless details or unimportant information. In fact, the whole story seemed to just fly right by and before I knew it – the book was over. The world of Petrarch's Library did take some time to get used to. I was afraid it wouldn't work, but something 'clicked' halfway through and I found it intriguing. I've seen some people compare the world to Harry Potter and that feeling they got when reading that series. I'm not sure I'd go that far, but there is a certain magical, unique feel to Petrarch's Library that makes the entire novel feel special. One of the amazing things about The Accidental Keyhand is that I really feel it appeals to both children and adults. Yes, for all intense and purposes it is a children's fantasy novel, but it really has a gripping, page-turning quality to it that will make adults like it. Adults will certainly like the way favorite books/literary characters are weaved into the novel without seeming forced. Overall, The Accidental Keyhand is a truly amazing, fun read. In fact, I almost wish I could become a Ninja Librarian – but I won't be asked! I anxiously await the next book in this series and until then, you'll be able to find me looking for an entrance to Petrarch's Library!